I have been told that plug-in hybrid vehicles are the next big thing in cars. So when the Porsche folks at Sime Darby Auto Performance Sdn Bhd — the authorised importer of Porsche vehicles in Malaysia — asked me a few weeks ago whether I would be interested in checking out the Porsche Panamera S E-Hybrid in Singapore, I consented without any persuasion. Fast forward. The drive in the new Panamera S E-Hybrid in the island republic went smoothly today. Let's face it — if anything, Singapore boasts a well-connected road network, with efficient traffic systems operations and smooth traffic flow. The roads are smooth, clean and are of good quality. So what was the big surprise? Having lived in Singapore before, I got lost. And this was just within the Changi area. Sigh. How things have changed. The old Siglap market is no more. Moving on. My verdict after today's driving in Singapore? The all new Porsche Panamera S E-Hybrid is pure sorcery. It would seem like Porsche has applied some kind of technological sorcery to a battery-equipped Panamera to create a conscience-salving petrol sipping super-saloon. In a day spent driving the Panamera in all its available modes, I averaged 16.4km/l (32.3 km/l combined, claimed by Porsche) and still had an indicated 8km of electric range left when I reluctantly handed back the keys. Of course you can now plug your Panamera into the mains as you can with Toyota’s Plug-In Prius, a car particularly close to the new Panamera hybrid in spirit and engineering. 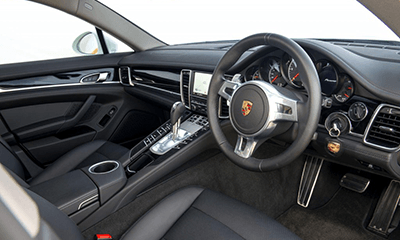 The Panamera's hybrid credentials also means there's a whole host of other regenerative factors that charge up the battery, like under braking, high-speed unrestricted highway style cruising, driving with just the petrol engine running and so on. If you haven't driven one before (yes, I am rubbing it in), there's a little "resistance" built into the accelerator pedal — pushing past this point unleashes the total electric motor/supercharged 3.0-litre V6 combo for maximum acceleration. Three buttons inside control the driving modes — Hybrid, E-Mode, E-Charge and Sport. Downsides? The additional bulk has a slightly detrimental effect on the Panamera's agility. And the brake pedal is soft and long, but not very strong. The gearbox is an eight-speed auto (yes, its Tiptronic). It does 0-100km in 5.5 seconds, with a top speed of 270km/h (electronically timed). The electric drivetrain of the new Porsche Panamera S E-Hybrid uses a lithium-ion battery which is five times more powerful than the 2013 predecessor’s nickel-metal-hydride battery. 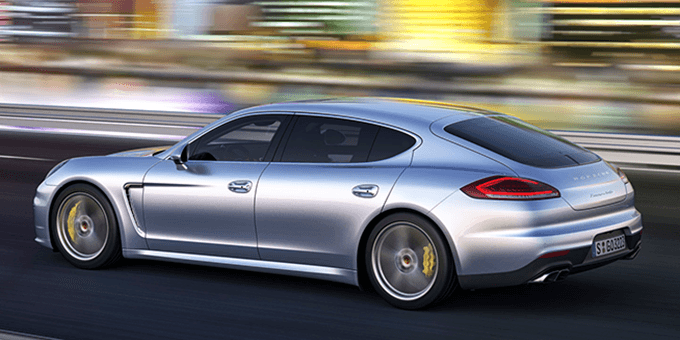 Is the Panamera a pretty car? No. Handsome? Maybe, if seen from the right angle. But is it really any more disturbing to the eye than a big BMW or Mercedes or Audi? I don't think so. Porsche Malaysia will make the Panamera S E-Hybrid available in Malaysia based on orders.